The mouse acceleration on Mac OS X is driving me nuts. It may work for touchpads but nothing beats the Windows' acceleration curves. Is there a way to modify the behaviour on OS X? I tried getting a Microsoft mouse driver for OS X but it didn't work since my mouse is not from Microsoft. 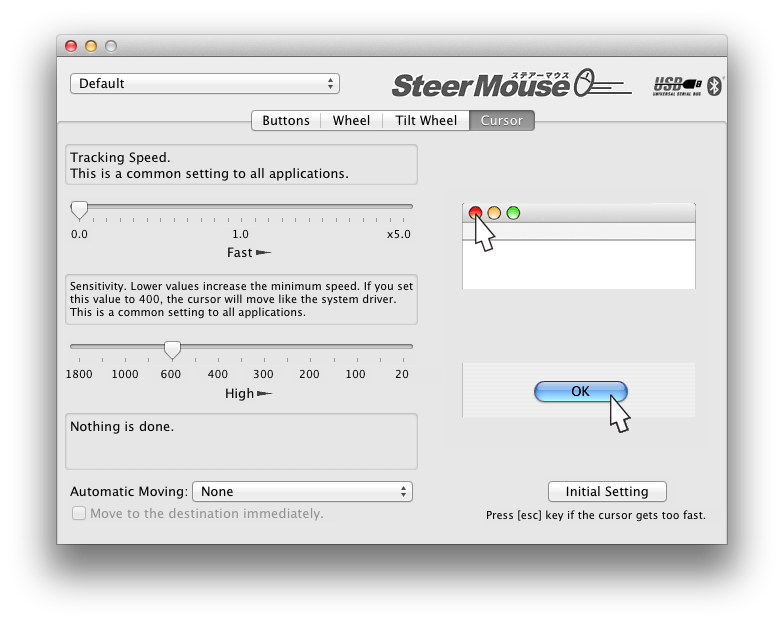 Take a look at Mouse Acceleration Preference Pane. Another new option is SmoothMouse. Its work on Mountain Lion and supports the Magic Mouse. Some folks are quite happy with it (discussion). I'm personally still deciding (but already think its better than standard OSX). This made it feel pretty Windows-y to me. Love Apple's trackpads, but the mouse settings are full of fail. To turn mouse acceleration back on, change anything in the mouse preference pane, or run the command again with 1 instead of -1. I may sound extreme, but I connect my mouse to a small, quiet, Windows laptop and use synergy with the mac as a client. This works well for me. None, and I repeat, none (I've tried all of them) of the available OS X mouse mods out there actually get your mouse to behave like it does on Windows. They just get you a little closer. Furthermore, regardless of the acceleration curve, OS X has a defect that causes many mice to make erratic jumping movements (apparently this is fixed in OSX Lion...) and no available software (except for OSX Lion) addresses it. Synergy is not a great solution, but it is a solution. In particular you should not run it over wifi and instead use as direct of an ethernet connection as possible to reduce the latency. Also a bummer is that sometimes my cursor disappears, and I have to switch apps with cmd+tab in order to restore it. As much as a perfectionist as Steve Jobs was, the cursor tracking on OS X unfortunately eluded his attention. The only solution is to actually use Windows, hence synergy. Don't be put off by the slightly naff website, this is the best one I've found available for Lion. You can download a trial - definitely worth a purchase though. Just set the tracking speed to 0 and set the sensitivity to whatever feels normal for your mouse. The command line version of mousefix/iMouseFix continues to work for me on 10.8 (also worked on 10.7 and 10.6) with the Apple MagicMouse and MacBook trackpad (some of the other suggested solutions don't work for the MagicMouse). I can quickly move the mouse between displays, but also do fine work with a setting of 3.5 on 10.8 and 8 on 10.6. FYI, The binary download is mousefix.tbz2 at http://code.google.com/p/mousefix-10-6/downloads/list. If you have a Microsoft Mouse, you can use IntelliPoint acceleration, which is like Windows. After disabling SIP, you can still install and use Microsoft IntelliPoint v305 on MacOS 10.13.6. You may need to restart after installing the driver, for a total of 3 restarts (1 to disable SIP, 1 to get back into MacOS, 1 after driver is installed). I find that you also need to activate the Microsoft Mouse preference pane after the computer restarts. set the current pane to pane id "com.microsoft.microsoftmouse"
Not the answer you're looking for? Browse other questions tagged macos mouse or ask your own question. How can I set mouse sensitivity exactly the same in Windows 7 and Mac OS X Lion? How to modify mouse acceleration curve on Windows to make it more MacOS-like? How can I make Windows XP mouse move like it does in OSX? Disabling scroll wheel acceleration on OS X Mavericks? How to get exactly same accelaration curve on Windows as in Mac OS X? Intercept mouse accel?